Sure, convertibles get no respect, but German tuner Brabus — home of the twin-turbo V12 — has nonetheless transformed the bougie E-Class Cabriolet into an 800-hp desert blaster. Respect comes at a price, though. Here, it costs $680,000. That's a lot of pooka beads, no? 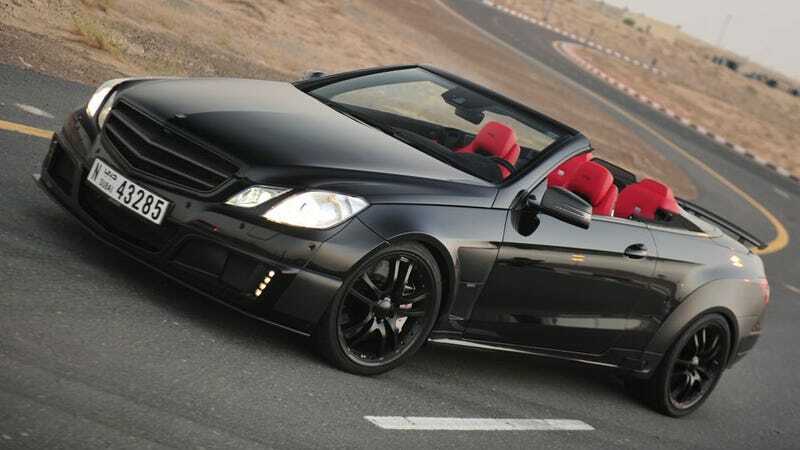 Then again, the Brabus 800 E V12 Cabriolet debuted at the company's Dubai branch. Brabus followed its tuning modus operendi, taking the 5.5-liter V12 from Mercedes-Benz's S 600, then bored and stroked it to 6.3 liters, before adding two turbochargers and four intercoolers. They also somehow reinforced the E-Class's five-speed automatic to handle the electronically limited 811 lb-ft of torque (max is 1,047 lb-ft). All that extra breathing required a bunch of new intakes — from a custom hood und scoop, and a new intake manifold. By way of Brabus's own limited-slip diff, the Brabus 800 E V12 Cabriolet gets from 0-60 in 3.7 seconds, to 124 mph in 9.9 and to 186-mph in 23.9 seconds. The listed top speed of 231 mph naturally depends on the buyer's choice of final drive ratios. The suspension's been worked over as well. with adjustable coilovers developed with Bilstein calibrated to the heavier engine. The ride height can also be adjusted by up to 1.4 inches. Oh, you wanted brakes? 15.0 x 1.45 in. vented discs in the front with 12-piston calipers; 14.2 x 1.1 in. discs in the rear six-piston calipers. Stoppage equals goage. Respect for the droptop, or trying too hard?